Just to let you know, we just got our kids' school reports and they both got A's in Maths and English for the 2nd time, thanks to your great programs. Just wanted to let you know we appreciate it and we recommend them to all parents out there. I homeschool 3 from 11yrs, 9yrs & 5yrs. They can't wait to do their lessons everyday. Our 9yr old used to struggle at school, not anymore. Our 11yr old does'nt like to stop and 5yr old is taken off. Very happy. I higly recommend it. Thank you. Thank You Felicity and Anthony for helping me read with EnglishPOWER and my MyLetters CD. I really appreciate what you've done for me. I'd like to say thank you for letting me get an excellent report and getting an A for reading. From Benedict. Thanks Felicity and Anthony for making me get a Distinction in the University International Competitions for Spelling and Writing. Thanks so much for such a great maths tutoring program.My son has terrible concentration issues in the classroom. 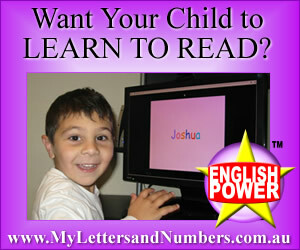 This maths program has helped him focus on the work at hand, and greatly improve his mathematics. He no more struggles. Thanks so much! this website has alot of maths and english this has taught me alot i need to tell my friend all this and my teacher this has english that is so cool instead i dont need to do maths on my laptop i just go on this. The new English program is just as fantastic as Maths Power. Theses are absolutely the best educational purchases we have made for our children.